You are here: Home » handmade gifts » Handmade Valentine’s Day Cards — quick and easy! Handmade Valentine’s Day Cards — quick and easy! My handmade Valentine’s Day cards are quick, easy, and adorable. They are today’s contribution to Craft Lightning. Every day this week I will be posting a quick Valentine’s Day craft in the morning along with my partner for this series 30 Minute Crafts. Then each afternoon I will be posting features from around the web. Want a chance to be featured? Be sure to link up to our Craft Lightning linky party. Missed any of the action this week? Check out the round ups from day 1/2, day 3, and day 4. 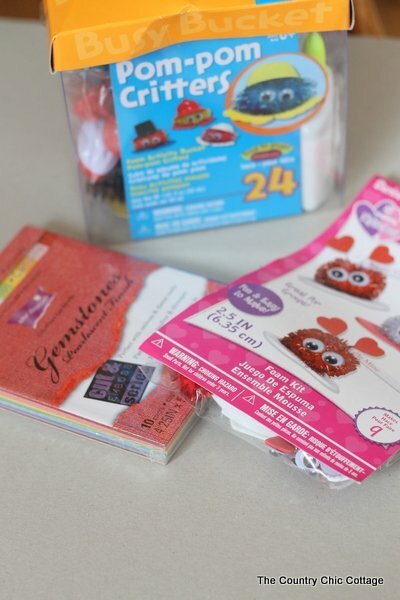 Now lets get crafty on these handmade Valentine’s Day cards. Y’all have a fuzzy Valentine’s Day! This project was originally posted over at Crafts Unleashed but I am publishing here in case y’all missed it. Some of the supplies for this project were provided to me as part of my design team status with Consumer Crafts. All projects and opinions are my own. 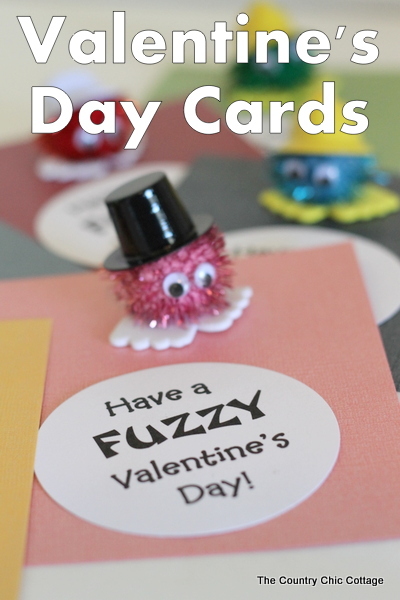 Print “Have a FUZZY Valentine’s Day!” on white card stock. Cut with whatever method you have available. I used a circle die with my Sizzix Big Shot. You could even use a pair of scissors or paper cutter and alter the design to a square or rectangle. The pom pom critters kit comes with everything you need to make your little pom pom guys. My kids loved helping with that part of our Valentines making party. I then just hot glued the critters and the punched paper circles to the precut gemstomes paper. So simple yet cute and gives a handmade touch to your Valentine’s gift giving. My handmade Valentine’s Day cards will be the talk of the classroom come February. Plus the little critter will be a non-candy treat that each child will get to take home to play with. Will you be making handmade this Valentine’s Day? Make something super simple like this and let the kids get involved. You will have more fun and they will too! Y’all stay tuned all week as Craft Lightning is just getting started good! 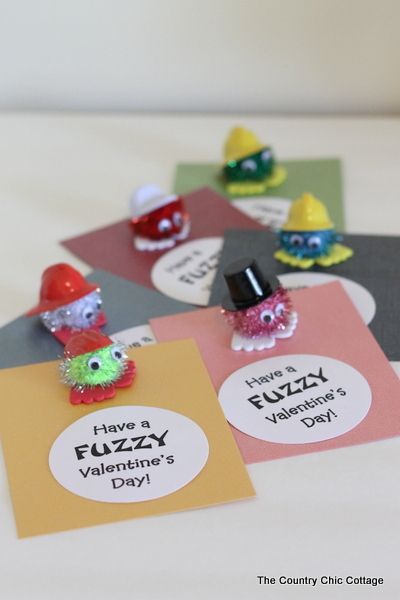 I love these fuzzy Valentines! And not just because they have googly eyes!